Buying online movie ticket is so rewarding. In this post, i will show you how you can buy two movie tickets in less than Rs. 100. 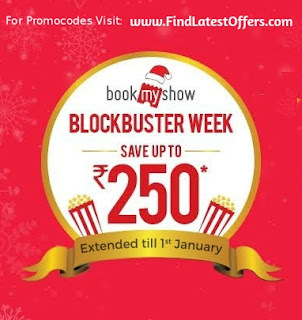 BookMyShow has increased marketing to prove he is niche player for online movie booking. After successful payment through Freecharge, You will get Rs. 100 Cashback in Freecharge wallet. If ticket prices is Rs. 150, It will be 300 for 2 tickets + 46 Booking fees. Price After Discount: 346-250 = Rs. 96! Offer is valid till 1st January. Enjoy this weekend with your friends.